Ask fellow campers about "Tetilla Peak" and nearby attractions. 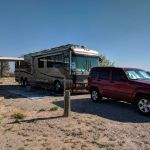 I am not very good about booking campgrounds far in advance, and sometimes that's a problem around holidays. 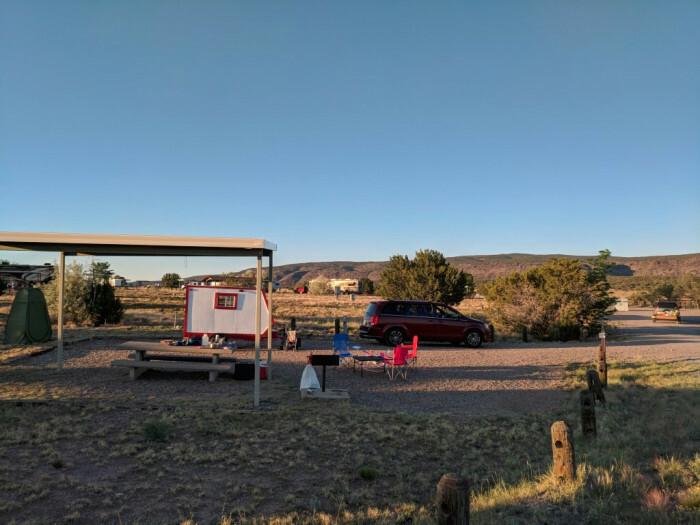 I was looking for spaces available near Santa Fe, and found that there were two COE parks on two sides of Cochiti Lake, south of Santa Fe. 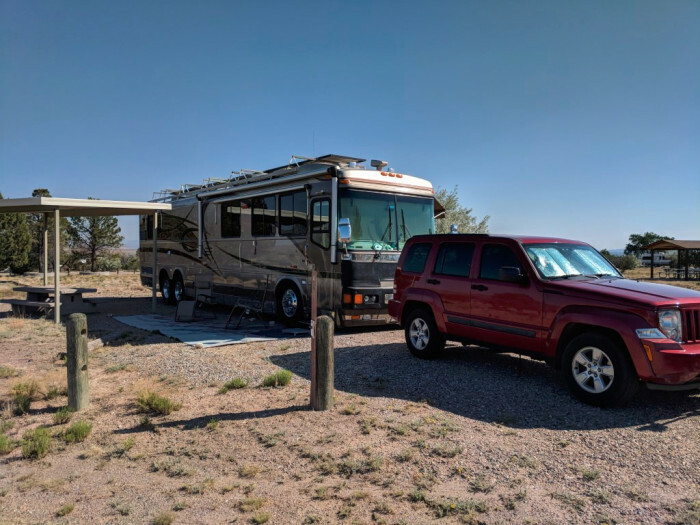 I could get a site in the one that is east of the lake, Tetilla Peak Campground, for the weekend that included Memorial Day. The good news: the campground is good, sites are well spaced away from each other, 30A electric and water with a dump station. There are also some non-electric sites (35 electric, 9 non-electric). There are a lot of lake access locations (and boat launch) just down from the campground if you want to kayak or stand-up paddleboard, canoe, or even put a motorboat or sailboat into the lake. The sites are not completely level, but we were able to get our bus leveled with jacks. The bad news: There is about a 10 mile drive off the highway that takes you to I-25, and this road has a number of potholes, some pretty severe. I have found that it is easiest to drive straddling the center line and that gives me the best flexibility to avoid the potholes. There isn't a lot of traffic on the road, so you don't have to worry about being on your side of the road much of the time. The roads inside the campground and sites are gravel. When we got here, we missed the turn that would take us to the entrance to the campground and drove down to the end of the road and around the loop there (thankfully large enough that we could turn around in it). There appears to be a place where a sign used to be that would mark the turn into the recreation area. 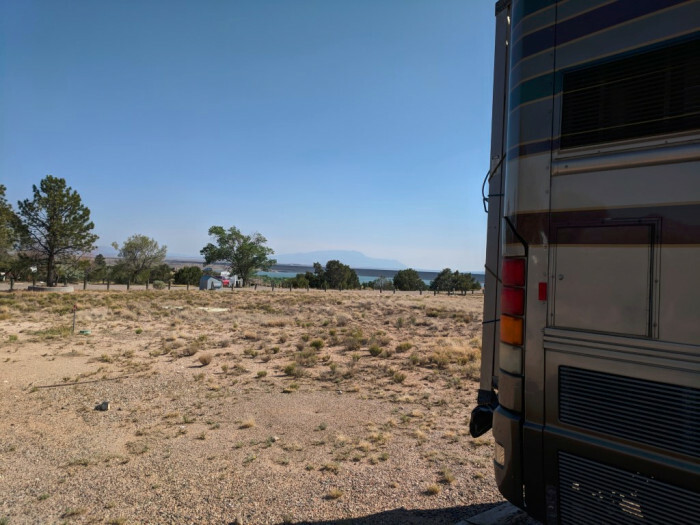 If you have the option, I think Cochiti Lake COE Campground on the other side of the lake is easier to access and looks like a nicer campground We camped at Tetilla Peak in a Motorhome. Kasha-Katuwe Tent Rocks National Monument was an interesting place to visit. We are not major hikers but enjoyed the Cave Loop walk/hike. 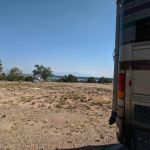 This is an older COE on the opposite side of Cochiti Lake from the main Cochiti Lake campground. The view is beautiful but this campground needs some long required TLC. In addition, the long ride into the campground has many huge potholes on both sides of the road. 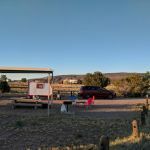 The town of Cochiti Lake has a golf course but only a convenience store, gas station and laundromat so the only shopping is in Santa Fe, some 35 miles plus away. The roads in the campground are all gravel as are all the sites. This could be a really nice quiet place if some clean up was done and the road repaired. We camped at Tetilla Peak in a Motorhome. Are you affiliated with Tetilla Peak ?